Compared to the 40m diameter ELT, which will likely be used for 100 years and more, the JWST will fail 10 years after launch due to lack of fuel. If he can no longer stay on point L2 Lagrange, it will be difficult to target the stars and we will lose contact with him. Another disadvantage of telescopes put into orbit, a breakdown on these space facilities forces the sending of a team of astronauts on site, raising the cost of such infrastructure at great prices. In short, the JWST is not profitable and we can thank the American senators who agreed to sign the bill. The future of terrestrial observatories remains assured and all the more knowing that they take advantage of state-of-the-art techniques (very high-resolution CCD, ultrathin mirror, adaptive optics, cooled mirror, bearings on oil bath, VLTI, etc.). Their lower cost than space telescopes also makes it possible to multiply their number, the only way to continuously follow certain planetary and extragalactic phenomena. But in the future, space projects are nonetheless indispensable and will be even more ambitious. Thus, NASA in collaboration with BOEING envisages nothing less than to build in the space of the hypertelescopes of 150 km of diameter! 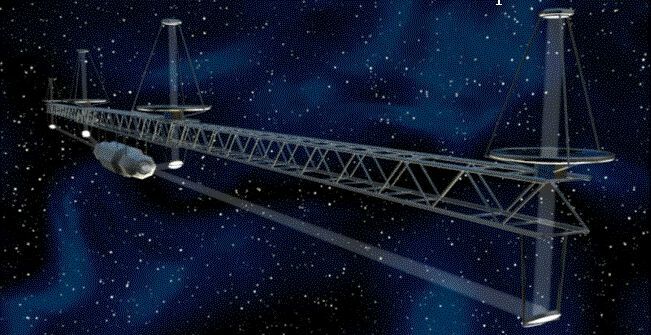 According to Antoine Labeyrie, such a telescope would consist of 150 mirrors of 3 m in diameter each operating in interferometry. LISE, Hyper-OVLA or Lopez’s Redundant Linear Array would be able to discern details of 10 km on the surface of a planet the size of the Earth at 10 light-years or to observe the surface of nearby stars with a resolution of 50 meters! It leaves dreamer. Observe, listen to or analyze the stars throughout the electromagnetic spectrum does not satisfy the curiosity of researchers. The approach of the scientific community can not stop once the practitioners (astrophysicists, radio astronomers, etc.) have closed the door of their observatory. Theorists (mathematicians, physicists, cosmologists, etc.) need to know the results obtained during these observation programs to corroborate, refine or even refute their theories and possibly predict new facts that practitioners will try to observe. The role of any scientist is to try to understand by reproducing on a small scale what he has observed. It started with the prism that reproduced the colors of the rainbow and the spectrum of stars and continues today with particle accelerators trying to discover the missing particles in the quantum taxonomic classification and the supercomputers that try to simulate the properties of celestial objects and the Universe. Let’s see how astronomers exploit computer science to better understand the nature and properties of the stars. This is the subject of the last chapter. Next post What is Light?